One of the most unusual clashes in naval history occurred on September 14, 1914 when two former passenger liners fought one another off the coast of Brazil’s Trinidada Island. At the outbreak of World War 1, both the British and German navies put into effect plans calling for the arming of certain ships as auxiliary cruisers to act as wartime supplements to their naval forces. 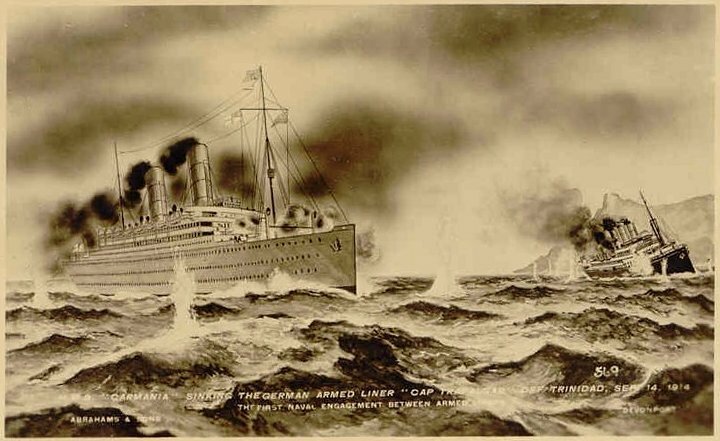 Two such ships were the SS Cap Trafalgar and RMS Carmania. The SS Cap Trafalgar had been built in 1913 and operated between Hamburg, Germany and South American ports. Following the declaration of war, her civilian crew was replaced by officers and seaman of the German Imperial Navy and she was armed with 2 4.1in. guns. Thus she became SMS Cap Trafalgar and was charged with hunting down and sinking Allied shipping in the South Atlantic. SMS Cap Trafalgar’s opponent, RMS Carmania, was a British mail liner built in 1905 for the Cunard line’s Liverpool to New York route. Similar to SMS Cap Trafalgar, RMS Carmania was commandeered by the British Admiralty and became HMS Carmania on August 8, 1914 when she was armed with 8 4.7 in. guns. Unlike Germany’s auxiliary cruisers, Britain utilized its cruisers to protect merchantmen or assist in the hunt for Germany’s merchant raiders. The two ships were destined to come across one another after each were given orders to proceed to Trindade Island – the Germans were to rendezvous with colliers and the British suspected the island was being used by the Germans as a supply point. Caught with two colliers in broad daylight, the Cap Trafalgar at first fled from the pursuit of the Carmania, however, the Germans reversed course and turned to engage the Carmania. After a brisk 70 minute battle, with both ships ablaze and holed below the waterline the Cap Trafalgar capsized and sank with the loss of 51 officers and crew. While the Cap Trafalgar had been sunk, it had inflicted serious damage on the Carmania and she required extensive repairs at Gibraltar’s dry dock. The Carmania finished out the war in British service and was eventually scrapped in 1932. Even though it involved two of the largest, fastest and most expensive ships in the world, the engagement was of little strategic consequence and is now merely a strange footnote in naval history.